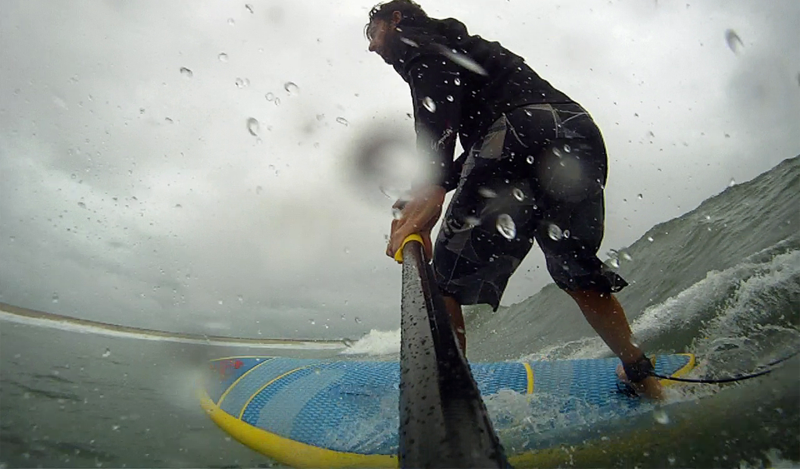 Bill's OBX Beach Life: What a Finale to the Leslie Swell and Week of S Wind! What a Finale to the Leslie Swell and Week of S Wind! Saturday was the final icing on an extremely tasty cake of wave sailing FUN last week as H/TS Leslie pitched long period SE swell to our beaches. SSW wind on Saturday ramped into the mid/upper 20s mph and provided perfect Hatteras world class wavesailing conditions! The magic spot was at the Washout located 2 miles south of Oregon Inlet. Most of the local wave crew was there along with a number of visiting sailors here early for the AWT Hatteras Wave Jam. What a final primer for the event and the best wave sesh yet this year! Additionally, Sam F sent in this sweet onboard pic SUPing the SeaLion at the Cove Sunday, Sept 9! Also, the AWT Hatteras Wave Jam STARTS this week!! Wind forecast is moderate, and surf should be quite FUN! NE/ENE will be the wind direction so event will happen at Ramp 55 at the Hatteras Ferry Docks. Day Three Leslie Action, This Time... Cape Point! Day Two Leslie Big Swell Action at Coquina Beach! EPIC ALERT, Hatteras Wavesailing Next Week! AWT 2012 Hatteras Wave Jam Rider List! 14 Days to AWT Hatteras Wave Jam Week! The Hatteras Weekend Warriors Score! !